Your face is exposed to many substances, pollutants, and materials so it is not surprising if you start developing facial issues, such as acne, pimples, or even facial lesions. In the debate about pimple vs cyst, most people often mistake the two problems as the similar issue – in reality, they are completely different. Since they are caused by different triggers, the solutions will be different as well. If you understand the condition better, you know how to spot on the difference and come up with the perfect solution. It is pretty easy to spot a pimple as a cyst, or vice versa, because they share almost identical features: they are bumpy and they have reddish appearance. But that’s about it. If you want to take a closer look, pimples are mostly pinkish or reddish while cysts are generally whitish or even yellowish. If you touch the bumps, you will notice that cysts have more tender appearance, almost to the point of being mushy. And in general, they are rather painful or create an uncomfortable feeling when touched. Whereas the pimple is caused by blockage of the skin pores (and also the poor hygiene of the facial skin), the cyst is caused by infection. When the skin pores are blocked or clogged, they trap oil, debris, and sebum (the natural facial oil). When such a condition is affected by bacterial presence, infection may happen. And that’s when the cyst starts forming. 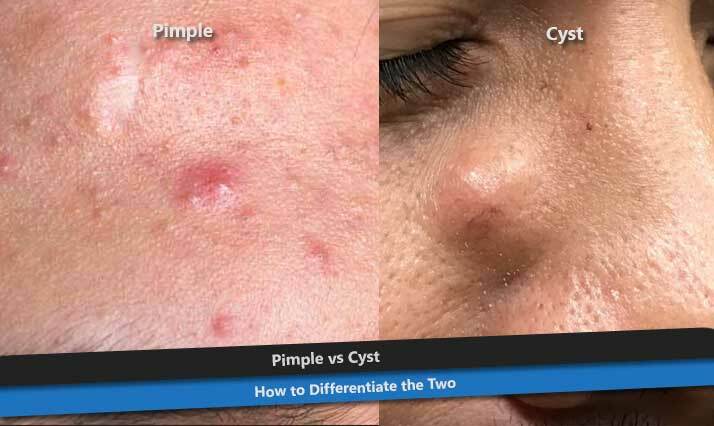 Again, you should be able to spot on the difference of pimple vs cyst. A pimple is a condition where there is a pocket of membrane filled with oil, debris, and dead cell skins. When it is mature enough, the surface will protrude and you can see the white or black head. A cyst, on the other hand, is a pocket filled with solid liquid. It is rounder and generally filled with white or yellowish pus. A pimple is just a pimple. After all, it is a condition where the pores are clogged. A cyst, however, can be divided into various different types. Sebaceous or facial cyst is the one looking like a pimple. Acne cyst is the next development of acne where bacterial infestation present. Nodulocystic acne is the severe type of pimple where there are nodules of inflammation and infection taking place under the skin. This kind of cyst is painful. There is a high possibility that it will leave a scar when healed. Dermatologists would recommend over the counter medicine to deal with acne. But if it fails and the problem persists, they may suggest prescriptive medicine. The treatment for cyst is a bit different, though. If it is mild, it will go away on its own. But if it is quite serious, they may inject a corticosteroid solution to treat the inflammation. It is also possible to implement carbon dioxide laser treatment to prevent scarring issue. Paying attention to your facial health and hygiene is a good thing as it will prevent any skin issue. But when you spot a problem and you can’t tell the difference between pimple vs cyst, it is better to consult a doctor.